Pop your tortellini in a pot of rapidly boiling water that has been generously salted and cook as per instructions on the pack. (I must say that the Woolies fresh tortellini is fantastic and cooks very quickly). While thats going on, heat a pan on low heat, add a little olive oil and cook your garlic for about a minute until it is sizzling but not brown. 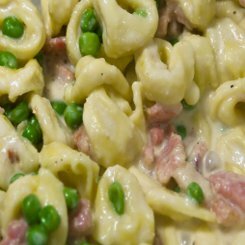 Add the peas, ham and then the cream, season with a grind of black pepper and a pinch of salt. Bring the sauce to a boil and allow to boil for 1 minute. This cooks the peas and brings all of the flavours together. Remove from the heat, toss in the tortellini and gently mix it in using a folding movement. (You want to be really careful here so that you do not break the tortellini) If you are a good flipper of the pan, flip the tortellini around until every piece is coated in the sauce. Serve immediately with a generous amount of Parmesan. Serve with a salad and a few sliced of toasted ciabatta rubbed with a garlic clove. hi there! Im not a fan of ham so what could i substitute that with? Hi again, here you go.